I've admitted before that I'm a messy scrapper. As I work, my desk gets covered in little bits of patterned paper and embellishments or stamped images that didn't make it onto a page for one reason or another. When I clean up, I tend to think that these little bits and pieces would make great cards. 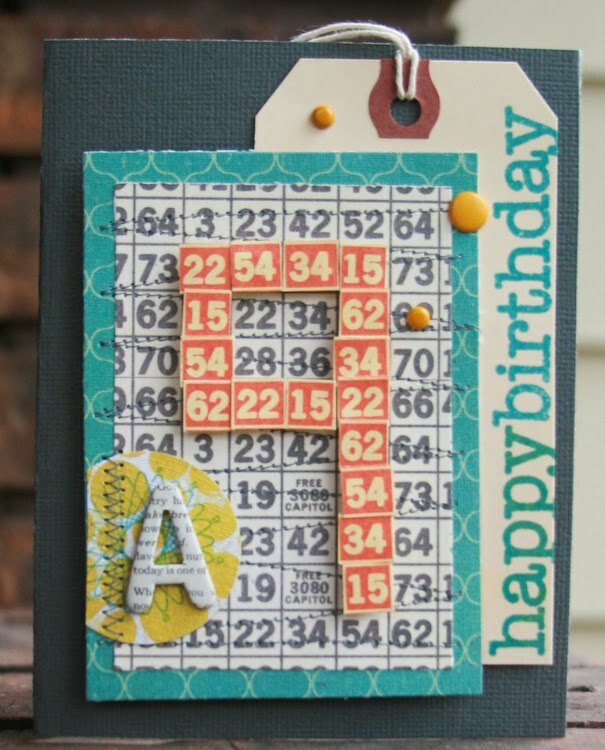 This card uses mostly bits from my most recent page - piggy rides. The 3 circles were already punched in the backing from a package of Studio Calico's rubons. I had stamped the house in Mustard Seed before settling on Tumbled Glass for the page, so I used that along with a scrap of the Home Front Blown Fuse paper. I finished the card with some stitching, vintage seam tape and bits of fabric from a recent sewing project. This card uses leftovers from my Joyland kit. I liked the effect of layering these two papers when I used it on my 3 of a kind page, so I used the same technique to make a big "9" for my oldest's birthday. So that's our challenge for this week. 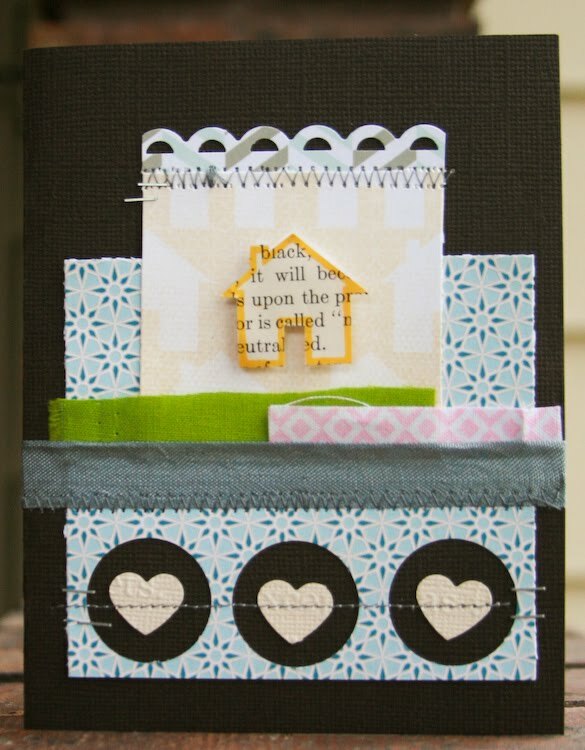 Take the leftover, cast aside and not used items from your last project and throw them together into a quick card. Post a link to your card on this thread on the message board, and we'll draw one winner for a $5 gift certificate to the shop. You've got until midnight EST on Saturday night to enter! Oh man, this challenge was made for me. I do this all the time. Some people might call it 'too lazy to go to the store and buy a bithday card', I call it creative. Off to make a few cards! I may just be able to pull this off. I'll have to see what I can do. :) I save tons of paper scraps. I almost threw them away when I was reorganizing last week. Luck I didn't, right? i just finished making a card from my scraps! will post it in the a.m.! I have the perfect leftovers for this challenge! We'll see if I can get all the midterms graded in time! Awesome challenge! And it must be in the air! 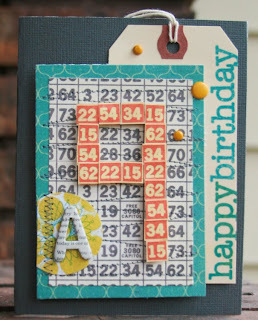 I just posted a tutorial on making cards from scraps! LOL! Here's mine! Since I haven't cleaned my scrap table recently, all these scraps were actually "at hand"! Perfect timing on this challenge! I needed to make a thank you card AND I've had some scraps left over from projects for ages and they needed to find a home. The thread I used to fasten the envelope is left over from grade school and the polka dotted paper was left over from a LO that totally failed and got taken apart. The purple frame was also in my scrap pile. SO glad to finally use this stuff! it was really great to use up some little bits on my desk... especially since they were from two of my favorite patterned papers. thanks for the fun challenge! OK I am not really a card maker but I gave it a try. Here is mine using some scraps of Quilting Bee. this is just one of 3 that I made...love using up some super old scraps! Haha my workspace is always a disaster after making a page. I tend to have lots of left-over photos as well as bits of paper, so I used all of it on this card that I make for my brother-in-law (who just cut down our massive tree).